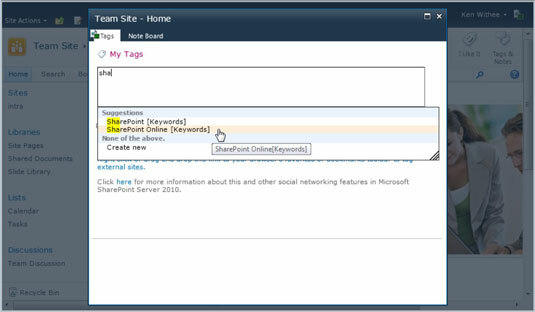 SharePoint Online includes a couple of features to help navigate and search a site based on the tags and notes left behind by yourself and others. 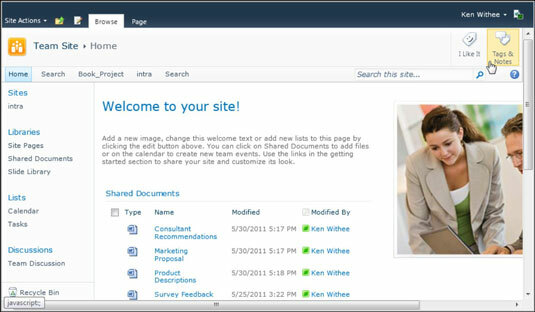 A SharePoint Online site often grows over time to include lots of pages and content. Keeping track of all this content can be a daunting task. To add a tag or note to a page, click on the Tags and Notes icon in the upper-right corner of the page. The Tags & Notes page lets you enter your own tags and leave notes about the page. SharePoint keeps track of all the tags throughout the system and automatically recommends tags that are similar to the tag you are starting to spell. To leave a note, you simply click on the Note Board tab. A popular way to visualize tag data is a utility known as a tag cloud. A tag cloud is a cloud-shaped image with keywords, also called tags, located throughout the cloud. The physical size of the keyword is a direct relation to how popular that particular tag is in the keyword collection. Notice that SharePoint is the largest word, which indicates that “SharePoint” is used the most frequently out of all the words that make up the tags. You can view others tags and notes as a feed similar to Twitter. If you want to keep your tags private, you can select the Private check box on the page where you enter the tag.